As part of the World Bank project “Faecal Sludge Management: Diagnostic Tools and Guidelines for Service Delivery in Poor Urban Areas” AKUT was commissioned in May 2014 with the implementation of surveys related to faecal sludge management in Lima, Peru. These surveys are part of a worldwide investigation that takes place in five cities on four continents. This involves conducting a household survey (720 households) and focus group discussions, collecting and analysing faecal sludge samples and undertaking and documenting transect walks and field observations. The project runs until September 2014. As part of the GIZ project “NEXUS – Water, Energy, Food Security”, a total of 36 participants were trained in a workshop on solar irrigation lasting several days in September 2018. The workshop took place in the Universidad Católica Boliviana (La Paz) and was attended by local and international experts, researchers and students as well as members of Bolivian institutions and authorities (e.g. Ministry of Environment and Water). The participants shall serve as multipliers by integrating the gained knowledge into their daily work. The contents of the workshop included the topics renewable energies, description of typical photovoltaic applications with focus on agriculture, description and characterization of solar water pumps, irrigation needs and techniques, water needs, planning and design of solar irrigation systems, economic evaluation and financing of solar irrigation systems, description and practical application of the tool box “Solar powered irrigation systems” as well as practical applications and design of solar pump and irrigation systems. The workshop can be classified as a success. More than half of the participants stated in an evaluation that they could apply the acquired knowledge in their field of work and all participants stated to be satisfied or very satisfied with the results of the workshop. 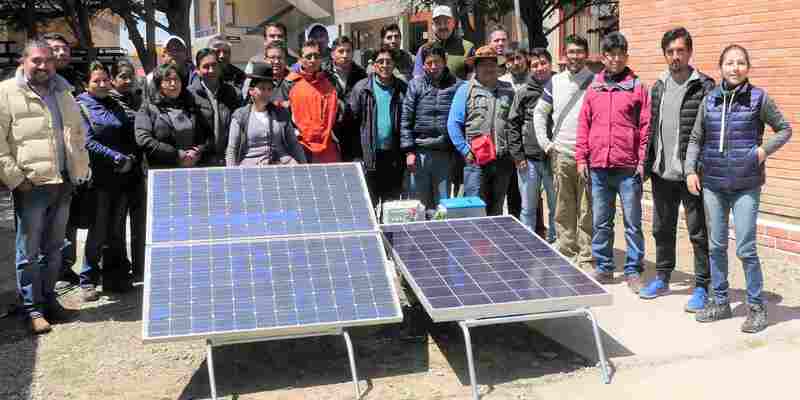 As a result of the discussion between members of various stake holders the potential for solar irrigation in Bolivia could be classified as very high. The workshop is one of several training cycles within the GIZ project “NEXUS – Water, Energy, Food Security”. This project, which runs from August 2017 to October 2019, includes workshops of this kind as well as the development of management models and financing concepts for two selected pilot projects with Nexus character and Integrated Water Resources Management (IWRM). AKUT has been commissioned to provide advice for a multi-purpose dam project (Misicuni). A water distribution plan is to be elaborated in order to balance out the water use between agricultural use (irrigation), drinking water supply and secure energy production. The adaptation to climate change (e.g. reduction of the available quantity of water, increased need for irrigation) shall be achieved through the development of proposals for the management of the limited resource of water with the various user groups. A GIS-based open-source information system is to be set up in order to present and design the water supply and distribution in a transparent manner. Another important objective of the project is poverty reduction. Solar irrigation should contribute to this by reducing water and energy consumption. In addition, poverty is to be reduced by reforestation and the introduction of agroforestry systems to sustainably improve land use in the upper reaches of catchment areas. Companies that discharge production waste water into the sewage system (indirect dischargers) must comply with the discharge limit values of the respective wastewater utilities. If limit values are tightened the challenge is to develop particularly economical solutions that avoid the installation of a complete new wastewater treatment plant. AKUT was assigned to develop a solution for a similar situation regarding the wastewater discharge of the phosphating plant at Robert Bosch Automotive Steering GmbH in Berlin-Wittenau. Current studies show that the implementation of technical adaptation and optimization measures at the chemical-physical waste water treatment plant has been successful in regards to tightened limit values. The measured total phosphate values in the discharge of the cleaning plant after the conversion have dropped to 90 percent less than the new limit values for discharge into the sewer system of Berliner-Wasserbetriebe (BWB). The effluent limits for total phosphate were reduced to 50 mg/l by BWB beforehand. 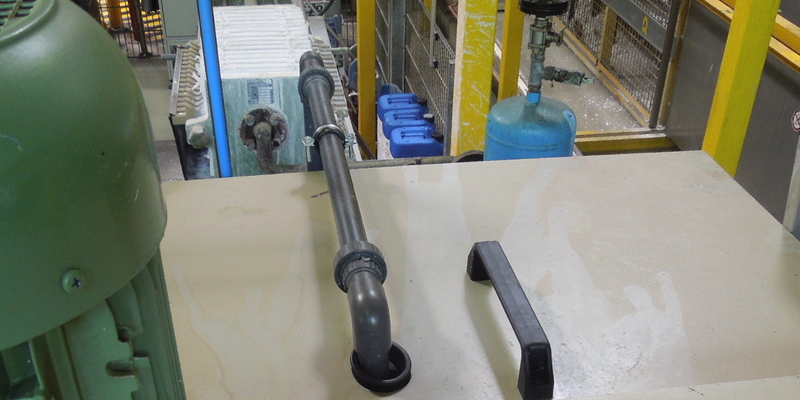 Robert Bosch Automotive Steering GmbH had then decided to technically convert the existing plant for the removal of metal ions from wastewater to ensure compliance with the reduced phosphate discharge limit value. AKUT Partner designed the cost-effective adaptation solution after an intensive assessment. By converting, technically supplementing and optimizing the existing treatment plant, the phosphate is (now in addition to the previously precipitated metal ions) precipitated with automatically dosed lime and separated from the wastewater in an existing chamber filter press. The contract included that the selected plant concept has been supervised and monitored until final acceptance and commissioning. As requested by the customer the TÜV approval of the now semi-automatically operated chemical-physical wastewater treatment plant passed the plant without imposing any additional requirements. Other relevant effects of the extensive automation of the wastewater treatment process are time savings for the operating personal and a reduction of the electric energy demand. The low investment costs (compared to the installation of a new wastewater treatment plant) and the positive effects on operating costs increase the overall profitability of the phosphating plant in Berlin-Wittenau. Photo: Robert Bosch Automotive Steering GmbH, Berlin – Wittenau. Buffer tank for the phosphate-containing wastewater, in the background the chamber filter press for separating the lime sludge. Overall, the framework conditions in South Africa for the generation of electricity from sewage gas are rather difficult. The remuneration for feed-in from renewable energies is fixed at auctions, this procedure prefers scalable technologies such as photovoltaics. Biogas, on the other hand, is limited by the availability of raw materials. This restriction applies in particular to the conversion of sewage and landfill gases into electricity. The unique selling point of biogas, simple storage and power generation at peak times, is also not affected by this process of auctioning. Thus, the only economically decisive factor on the South African energy market is the savings in own electricity consumption. The current electricity prices of around 1.20 rand/kWh (around 0.08 €/kWh) are low by German standards. However, the electricity price has multiplied since 2007: at that time, it was 0.013 €/kWh. In addition, annual price increases of 10% have been announced. In this field of tension AKUT was commissioned by the Deutschen Gesellschaft für Internationale Zusammenarbeit (GIZ) GmbH to prepare two studies on the use of sewage gas for the two sewage treatment plants Kingstonvalle and Zeekoegat. Against the current background of water scarcity in Cape Town, the relevance and explosive nature of the topic becomes very clear. The lack of rainfall is primarily attributed to climate change. The studies therefore identify emission reductions, in this case reductions in methane emissions, as a significant advantage in addition to economic advantages. At present, the gas produced by sewage sludge digestion is released into the atmosphere without further measures. This is now to be changed so that the gas is collected, processed and used for power generation. The studies present detailed comparisons of various technical components, operating models and organisational forms. 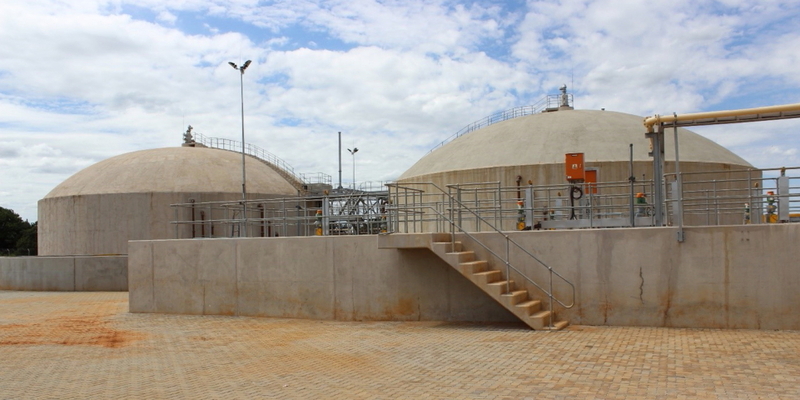 In both sewage treatment plants, the economic benefit can be maximised by optimising the utilisation of the existing digestion towers. Capacity utilisation is to be increased by adding so-called co-substrates, either digested sludge from neighbouring sewage treatment plants or waste from the agricultural industry. The latter could be identified by local AKUT employees so that specific modelling could be carried out, taking into account both the biogas potential and transport costs. Economically reasonable are also the variants with an exclusive treatment of the sewage sludge of the sewage treatment plant. However, the then lower investments will lead to a slight reduction in profitability. In addition to the technical components and the various operational management, operator models from in-house operation to BOT models were also examined. Two preference variants were determined from six different operator models. The decision now lies in the field of politics. Should the measures be implemented? Which of the preferred variants is preferred? GIZ and AKUT are ready to continue to support the City of Tshwane and Mbombela municipalities – both in decision-making and in technical implementation. © 2019 AKUT Umweltschutz Ingenieure Burkard und Partner - All rights reserved.